This Saturday will see the launch of the new gallery space at Bath’s finest limited edition toy and artwork store, Iksentrik. 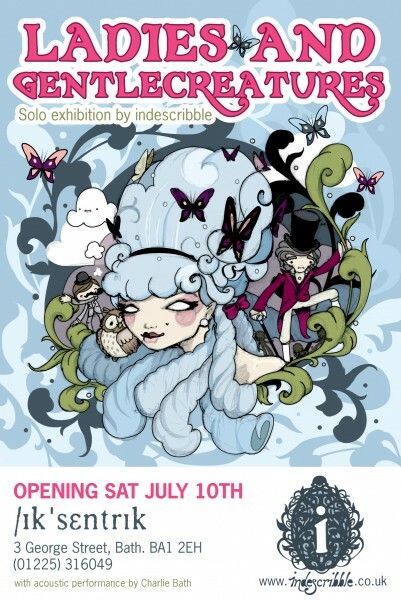 The new gallery opens with a solo exhibition from British artist Indescribble. Laura has been busy creating a mix of illustrations and paintings across canvas, panels and vinyl toys, especially for the show which kicks off this weekend. The launch takes place at Iksentrik at 5-7pm and will be accompanied by an acoustic performance by Charlie Bath. More info on the flyer above, and more from Indescribble here.